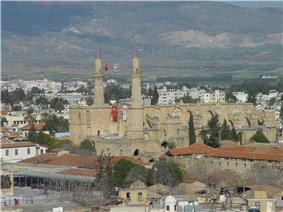 Northern Cyprus is a ECO, and has observer status in the PACE under the title "Turkish Cypriot Community". A united Cyprus gained independence from British rule in August 1960, after both Greek and Turkish Cypriots agreed to respectively abandon plans for enosis (union with Greece) and taksim (Turkish for "partition"). The agreement involved Cyprus being governed under a constitution which apportioned Cabinet posts, parliamentary seats and civil service jobs on an agreed ratio between the two communities. Within three years, tensions between the Greek Cypriots and Turkish Cypriots in administrative affairs began to show. In particular, disputes over separate municipalities and taxation created a deadlock in government. In 1963 President Makarios proposed unilateral changes to the constitution, via 13 amendments. Turkey and the Turkish Cypriots rejected the proposed amendments, claiming that this was an attempt to settle constitutional disputes in favour of the Greek Cypriots and as a means of demoting Turkish status from co-founders of the state to one of minority status removing their constitutional safeguards in the process. Turkish Cypriots filed a lawsuit against the 13 amendments in the Supreme Constitutional Court of Cyprus (SCCC). Makarios announced that he would not comply with whatever the decision of the SCCC would be, and defended his amendments as being necessary "to resolve constitutional deadlocks" as opposed to the stance of the SCCC. On 25 April 1963, the SCCC decided that Makarios' 13 amendments were illegal. The Cyprus Supreme Court's ruling found that Makarios had violated the constitution by failing to fully implement its measures and that Turkish Cypriots had not been allowed to return to their positions in government without first accepting the proposed constitutional amendments. On 21 May, the president of the SCCC resigned due to the Makarios' stance. On 15 July, Makarios ignored the decision of the SCCC. After the resignation of the president of the SCCC, the SCCC ceased to exist. The Supreme Court of Cyprus (SCC) was formed by merging the SCCC and the High Court of Cyprus and undertook the jurisdiction and powers of the SCCC and HCC. On 30 November, Makarios legalized the 13 proposals. In 1963, the Greek Cypriot wing of the government created the Akritas plan which outlined a policy that would remove Turkish Cypriots from the government and ultimately lead to union with Greece. The plan stated that if the Turkish Cypriots objected then they should be "violently subjugated before foreign powers could intervene". On 21 December 1963, shots were fired at a Turkish Cypriot crowd that had gathered as the Greek police patrol stopped two Turkish Cypriots, claiming to ask for identification; two Turkish Cypriots were killed. Almost immediately, intercommunal violence broke out with a major Greek Cypriot paramilitary attack upon Turkish Cypriots in TMT—a Turkish resistance group created in 1959 to promote a policy of taksim (division or partition of Cyprus), in opposition to the Greek Cypriot nationalist group EOKA and its advocacy of enosis (union of Cyprus with Greece)—committed a number of acts of retaliation, historian of the Cyprus conflict Keith Kyle noted that "there is no doubt that the main victims of the numerous incidents that took place during the next few months were Turks". Seven hundred Turkish hostages, including children, were taken from the northern suburbs of Nicosia. 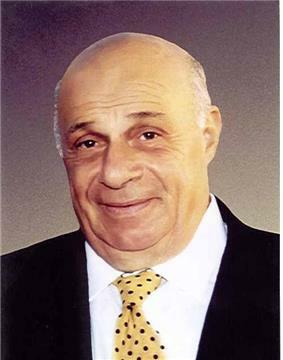 Nikos Sampson, a nationalist and future coup leader, led a group of Greek Cypriot irregulars into the mixed suburb of Omorphita/Küçük Kaymaklı and attacked the Turkish Cypriot population. By 1964, 364 Turkish Cypriots and 174 Greek Cypriots had been killed. Turkish Cypriot members of the government had by now withdrawn, creating an essentially Greek Cypriot administration in control of all institutions of the state. After the partnership government collapsed, the Greek Cypriot led administration was recognized as the legitimate government of the Republic of Cyprus at the stage of the debates in New York in February 1964. In September 1964, then–United Nations Secretary General, U Thant reported "UNFICYP carried out a detailed survey of all damage to properties throughout the island during the disturbances; it shows that in 109 villages, most of them Turkish-Cypriot or mixed villages, 527 houses have been destroyed while 2,000 others have suffered damage from looting". Widespread looting of Turkish Cypriot villages prompted 20,000 refugees to retreat into armed enclaves, where they remained for the next 11 years, relying on food and medical supplies from Turkey to survive. Turkish Cypriots formed paramilitary groups to defend the enclaves, leading to a gradual division of the island's communities into two hostile camps. The violence had also seen thousands of Turkish Cypriots attempt to escape the violence by emigrating to Britain, Australia and Turkey. On 28 December 1967, the Turkish Cypriot Provisional Administration was founded. On 6 July 1974, Makarios accused the Greece's government of turning the Cypriot National Guard into an army of occupation. On 15 July 1974, the Greek military junta of 1967–74 and the Cypriot National Guard backed a Greek Cypriot military coup d'état in Cyprus. Pro-Enosis Nikos Sampson replaced President Makarios as the new dictator. 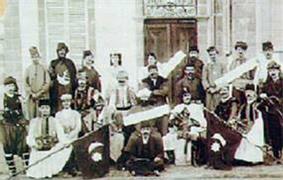 The Greek Cypriot coupists proclaimed the establishment of the "Hellenic Republic of Cyprus". Turkey claimed that under the 1960 Treaty of Guarantee, the coup was sufficient reason for military action to protect the Turkish Cypriot populace, and thus Turkey invaded Cyprus on 20 July. Turkish forces proceeded to take over the northern four-elevenths of the island (about 37% of Cyprus's total area). The coup caused a civil war filled with ethnic violence, after which it collapsed and Makarios returned to power. On 2 August 1975, in the negotiations in Vienna, a population exchange agreement was signed between community leaders  On the basis of the Agreement, 196,000 Greek Cypriots living in the north were exchanged for 42,000 Turkish Cypriots living in the south (the number of settlers was disputed). The Orthodox Greek Cypriots in Rizokarpaso, Agios Andronikos and Agia Triada chose to stay in their villages, as did also Catholic Maronites in Asomatos, Karpasia and Kormakitis. Approximately 1,500 Greek Cypriots and 500 Turkish Cypriots remain missing. The invasion led to the formation of the first sovereign administrative body of Northern Cyprus in August 1974, the Autonomous Turkish Cypriot Administration. The president is elected for a five-year term and is currently Mustafa Akıncı. The current Prime Minister is Ömer Kalyoncu. The legislature is the Assembly of the Republic, which has 50 members elected by proportional representation from five electoral districts. In the elections of July 2013, the left-leaning pro-unification Republican Turkish Party won a plurality of seats the Assembly. Freedom House has classified the perceived level of democratic and political freedom in Northern Cyprus as "free" since 2000 in its Freedom in the World report. The United States Department of State reported in 2001 that human rights were generally respected, although problems existed in terms of police activities and the restriction of movement. A 2009 report reported that religious freedom was generally respected, although isolated incidents of discrimination have existed. The US Department of State report in 2002 stated that freedom of speech and press was generally respected in Northern Cyprus, and the World Press Freedom Index 2010 ranked Northern Cyprus 61st in terms of freedom of the media. World Happiness Report 2015 of United Nations' Sustainable Development Solutions Network (SDSN) ranked Northern Cyprus 66th among 158 countries, directly above the Republic of Cyprus, which was ranked 67th. Gallup Healthways Well-Being Index of 2014 ranked Northern Cyprus 49th among 145 countries, above the Republic of Cyprus, which was ranked 82nd. Langdale, Allan (2012). In a Contested Realm: an Illustrated Guide to the Archaeology and Historical Architecture of Northern Cyprus. Grimsay Press. 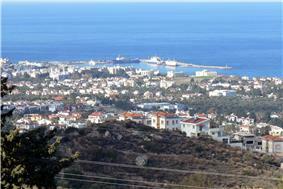 North Cyprus – a Pocket-Guide. Rustem Bookshop, Nicosia. 2006. ^ a b Economic and Social Indicators 2013. TRNC State Planning Organization. pp. 2–3. ^ a b "KKTC". Turkish Ministry of Economy. Retrieved 28 July 2015. 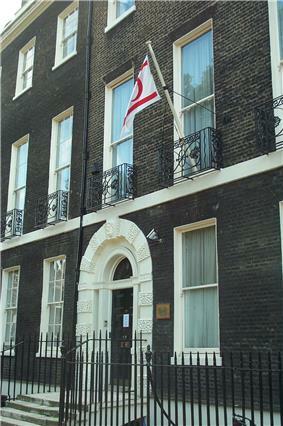 ^ International Chamber of Commerce (1 November 2003). Europe Review 2003/04: The Economic and Business Report. Kogan Page Publishers. p. 79. ^ The CIA World Factbook 2010. Skyhorse Publishing Inc. 2009. p. 182. ^ a b Ersun N. Kurtulus (27 November 2005). State Sovereignty: Concept, Phenomenon and Ramifications. Palgrave Macmillan. pp. 136–. ^ Scott Leckie (28 May 2007). Housing and Property Restitution Rights of Refugees and Displaced Persons: Laws, Cases, and Materials. Cambridge University Press. p. 448. ^ Quigley. The Statehood of Palestine. Cambridge University Press. p. 164. ^ Central Intelligence Agency (8 October 2013). The CIA World Factbook 2014. Skyhorse Publishing Company, Incorporated. p. 691. ^ Gideon Boas (1 January 2012). Public International Law: Contemporary Principles and Perspectives. Edward Elgar Publishing. p. 177. ^ a b Yael Navaro-Yashin (12 March 2012). The Make-Believe Space: Affective Geography in a Postwar Polity. Duke University Press. p. 8. ^ a b "The Cyprus Conflict". Archived from the original on 2007-02-17. ^ "Pre-Rejection of SCCC decision by Makarios : The fact that the decision of the SCCC would not be implemented by Makarios was made quite clear. Non-implementation of the decision of a Constitutional Court is sufficient reason to compel the resignation of its President" (PDF). Emu.edu.tr. Retrieved 14 February 2014. ^ "Majority rule means war.". Archived from the original on 2011-07-19. ^ "Supreme Court of Cyprus - FAQ" (in Ελληνικά). Supremecourt.gov.cy. Retrieved 14 February 2014. ^ "HUDOC Search Page". Cmiskp.echr.coe.int. Retrieved 14 February 2014. ^ Oberling, Pierre. The road to Bellapais (1982), Social Science Monographs, p.120: "According to official records, 364 Turkish Cypriots and 174 Greek Cypriots were killed during the 1963-1964 crisis." ^ Cook, Chris; Diccon Bewes (1997). What Happened Where: A Guide to Places and Events in Twentieth-century History. Routledge. p. 65. ^ "Links to documents". Un.org. 9 September 2002. Retrieved 14 February 2014. ^ Murat Metin Hakki (2007). The Cyprus Issue: A Documentary History, 1878–2006. I.B.Tauris. pp. 194–195. ^ Tozun Bahcheli; Tozun Bahcheli Barry Bartmann; Henry Felix Srebrnik (2004). De Facto States: The Quest for Sovereignty. Psychology Press. p. 168. ^ "Weekly UNFICYP trip to enclaved Cypriots a respite from daily hardships". Famagusta Gazette. 2014-01-30. Retrieved 1 October 2014. ^ Rainsford, Sarah (21 November 2006). "Bones of Cyprus missing unearthed". BBC News. Retrieved 14 February 2014. ^ "General Information". Turkish Republic of Northern Cyprus Public Information Office. Retrieved 14 November 2011. ^ Ker-Lindsay, James; Faustmann, Hubert (2008). The Government and Politics of Cyprus. Political Science. p. 253. ^ Yesilada, Birol (2013). EU-Turkey Relations in the 21st Century. Routledge. p. 2. ^ Thompson, Wayne C. (2014). Western Europe 2014. Rowman & Littlefield. p. 307. ^ Carlo Focarelli (24 May 2012). International Law as Social Construct: The Struggle for Global Justice. Oxford University Press. pp. 161–. ^ Carlo Panara; Gary Wilson (9 January 2013). The Arab Spring: New Patterns for Democracy and International Law. Martinus Nijhoff Publishers. pp. 59–. ^ Bartmann, Barry (2004). Bahcheli, Tozun; Bartmann, Barry; Srebrnik, Henry, eds. De Facto States: The Quest for Sovereignty. Routledge. p. 24. ^ Dodd, Clement Henry (1993). The political, social and economic development of Northern Cyprus. Eothen Press. p. 377. ^ "Report of the Office of the United Nations High Commissioner for Human Rights on the question of human rights in Cyprus : 16th Session, Human Rights Council, United Nations" (PDF). Ohchr.org. 7 January 2011. Retrieved 14 February 2014. ^ "Freedom in the World 2011 Report" (PDF). Freedom House. p. 29. Retrieved 24 April 2011. ^ "Cyprus: Population of Kurds in Turkish controlled Northern Cyprus; their treatment by the government of Turkey and its agents". Immigration and Refugee Board of Canada. 15 April 2002. Retrieved 17 April 2011. ^ "Cyprus Overview". Minority Rights Group International. September 2010. Retrieved 24 April 2011. ^ "2002 Report on Human Rights in Cyprus". US Department of State. 4 March 2002. Retrieved 24 April 2011. ^ "Press Freedom Index 2010". Reporters Without Borders. Retrieved 24 April 2011. ^ "Overview of the Human Rights Situation in North Cyprus". Turkish Cypriot Human Rights Foundation. 14 January 2009. Retrieved 25 April 2011. ^ "'Kuzey Kıbrıs'ta Hıristiyanlar yarı vatandaş'" (in Turkish). Agos. Retrieved 18 May 2015. ^ a b "Permanent Mission of the Republic of Cyprus to the United Nations —". Un.int. Retrieved 14 February 2014. ^ "Permanent Mission of the Republic of Cyprus to the United Nations —". Un.int. Retrieved 14 February 2014. ^ "Netwebsearch.com". Islamic-conference-news.newslib.com. Retrieved 14 February 2014. ^ "Council of Europe Parliamentary Assembly". Assembly.coe.int. Retrieved 14 February 2014. ^ "EU Sets Deadline for Turkey to Open Up Its Ports". ^ Charlton, Gill (5 February 2005). "On the case: non-existent flight; Northern Cyprus; children in the Algarve; Cannes". The Daily Telegraph (London). Retrieved 22 August 2011. ^ "Ercakica on the recognition of Kosovos independence". Hri.org. Retrieved 17 November 2010. ^ Sarah Fenwick (8 December 2009). "No Right To Self-Determination for Minorities – Cyprus". cyprusnewsreport.com. Retrieved 23 March 2011. ^ Fulya Özerkan (25 July 2010). "Verdict on Kosovo will not affect Turkey". Retrieved 23 March 2011. ^ Eric Solsten; Library of Congress. Federal Research Division (1993). Cyprus, a country study. Federal Research Division, Library of Congress. p. 232. ^ Doğu Mesarya Bölgesi, EU Coordination Center, retrieved on 28 December 2012. ^ Özden, Özge. "The Biodiversity of Invertebrates in Cyprus Ecosystems". University of Exeter. Retrieved 7 March 2015. ^ Kumda Yaşayan Prenses: Kum Zambağı, Havadis, retrieved on 28 December 2014. ^ Section source. Weather cypnet.co.uk. Retrieved 2008-09-14. ^ "Zaman Yazarları". Zaman.com.tr. Retrieved 14 February 2014. 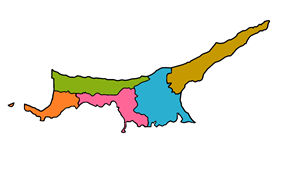 ^ "Why Northern Cyprus". TRNC Investment Development Agency. Retrieved 3 April 2015. ^ Legal Aspects of the Cyprus Problem: Annan Plan And EU Accession - Frank Hoffmeister - Google Books. Books.google.com. Retrieved 14 February 2014. ^ "Universities: Little accord on the island". The Independent (London). 8 November 2007. Retrieved 20 May 2010. 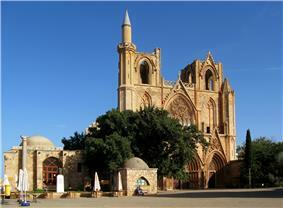 ^ "North Cyprus - TRNC information". 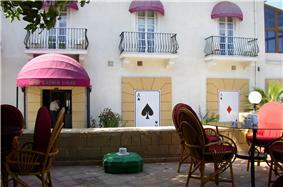 Cyprus-properties.com. Retrieved 14 February 2014. ^ "Tablo -3 Reel Growth Rate" (PDF). TRNC State Planning Organization. Retrieved 3 April 2015. ^ Great BritainForeign and Commonwealth Office (9 November 2010). Sixth additional protocol to the constitution of the Universal Postal Union, General Regulations of the Universal Postal Union, Declarations made on signature of the Acts, Constitution of the Universal Postal Union, Rules and Procedures of Congresses, Universal Postal Convention with Final Protocol, and Postal Payment Services Agreement: Beijing, 15 September 1999. The Stationery Office. p. 35. ^ Vesna Maric (2009). Cyprus. Lonely Planet. p. 229. ^ "Karpaz Bölgesi Yerel Kalkınma Stretejisi" (PDF). EU Coordination Committee of Northern Cyprus. Retrieved 13 January 2015. ^ """Girne esnafından ekonomi isyanı: "Yetkililer acil önlem almalı. Kıbrıs Postası. Retrieved 9 January 2015. ^ "KKTC’ye yıllar sonra ilk charter seferi". Yacht Life and Travel. Retrieved 13 January 2015. ^ "'"Turkey 'will open up to Cyprus. BBC News. 7 December 2006. Retrieved 20 May 2010. ^ "Merchant Shipping". Csa-cy.org. Retrieved 17 November 2010. ^ "Girne - Karpaz Yolu 50 Dakikaya İndi". Haber KKTC. Retrieved 13 January 2015. ^ "Kıbrıslı Türkler Kaç Kişi - Kıbrıs Postası Gazetesi - Haber Merkezi". Kibrispostasi.com. Retrieved 14 February 2014. ^ a b "Census.XLS" (PDF). Retrieved 14 February 2014. ^ Simon Bahceli (15 February 2007). "Indigenous Turkish Cypriots just over half north’s population". ^ "TC’den para isterken 700 bin diyorlardı". Kibris. 13 December 2011. Retrieved 23 December 2011. ^ "Nifus sayımı gerçekçi değil". Kibris. 11 December 2011. Retrieved 23 December 2011. ^ Cole, Jeffrey (2011). Ethnic Groups of Europe: An Encyclopedia. ABC-CLIO. p. 95. ^ Cole, Jeffrey (2011). Ethnic Groups of Europe: An Encyclopedia. ABC-CLIO. p. 97. ^ https://web.archive.org/web/20110725232040/http://nufussayimi.devplan.org/N%C3%BCfus%20Tablolar%C4%B1/Nitelikler/Tablo8.NITELIK.zip. Archived from the original on 2011-07-25. ^ Denver journal of international law and policy. 1993. Retrieved 29 November 2012. The invasion of Cyprus by Turkish troops in 1974 resulted in the widespread eviction and population transfer of over 170,000 Greek Cypriots from their homes in the northern part of Cyprus. In Cyprus v. Turkey, the European Commission on ..
^ William Mallinson (15 February 2011). Britain and Cyprus: Key Themes and Documents since World War II. I.B.Tauris. p. 8. ^ Wolfgang Hörner; Hans Döbert; Botho von Kopp; Wolfgang Mitter (19 December 2006). The Education Systems of Europe. Springer. p. 202. ^ a b Boyle & Sheen 1997, 290. ^ "Member profile". Inqaahe. Retrieved 14 February 2014. ^ a b "Near East University - Mercin - Turkey - MastersPortal.eu". MastersPortal.eu. Retrieved 1 October 2014. ^ "EUA members directory". Eua.be. Retrieved 14 February 2014. 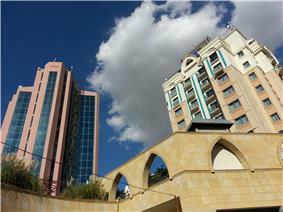 ^ "Eastern Mediterranean University". Icograda. Retrieved 14 February 2014. ^ "(Edu) Turkish Cypriot President Opens Girne American University'S Campus In Canterbury. - Free Online Library". Thefreelibrary.com. Retrieved 14 February 2014. ^ "COLLEGE SEARCH RESULTS". Archived from the original on 2007-12-13. ^ "Small Size Robot League - teams:teams". Robocupssl.cpe.ku.ac.th. Retrieved 14 February 2014. ^ "Yakın Doğu Üniversitesi Duyuru Haber » Faculty of Engineering of Near East University (NEU) is continuing to make contributions to the world of science through supporting the CERN Laboratory". Duyuru.neu.edu.tr. Retrieved 14 February 2014. ^ "Boşluğun hasadı kalemledir" (Radikal) retrieved on 31 December 2014. ^ "Haber: "Kayıp Otobüs" belgesel filmi haberi / Haber, Haberler, Haberi, Haberleri, Haber oku, Gazete, Gazetesi, Gazeteleri, Gazete oku". Turkmedya.com. Retrieved 14 February 2014. 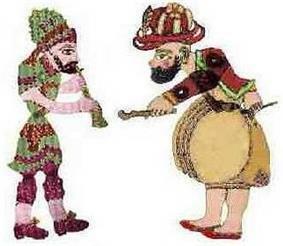 ^ Kıbrıs Tiyatro Festivali. 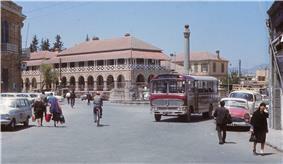 Nicosia Turkish Municipality and Nicosia Municipal Theater. ^ "World Football Elo Ratings". Eloratings.net. 10 February 2014. Retrieved 14 February 2014. 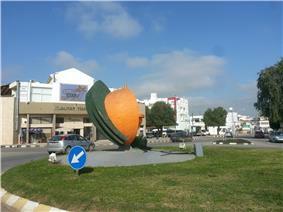 ^ "North Cyprus - Food and Drink (Cuisine)". Cyprusive. Retrieved 14 February 2014. 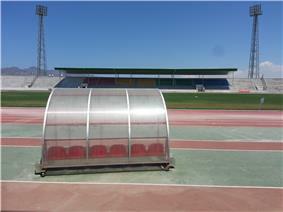 There are five stadiums in Northern Cyprus, with each holding a capacity ranging anywhere from 7,000 to 30,000. 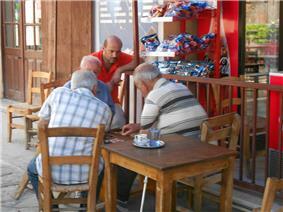 The most popular sport in Northern Cyprus is football. There are over 29 sport federations in Northern Cyprus with a total registered membership of 13,838, 6,054 been registered practitioners for, taekwondo-karate-aikido-kurash, with shooting having (1,150 registered) and hunting having (1,017 registered) members. Northern Cyprus' national football team currently ranks 109th in the Elo Ratings. Several of sport clubs participate in leagues in Turkey. These include the Fast Break Sport Club in Turkey's Men's Basketball Regional League; the Beşparmak Sport Club in Turkey's Handball Premier League; and the Lefke European University Turkey Table-tennis Super League. Water sports such as windsurfing, jetskiing, waterskiing and sailing are also available at beaches throughout the coastline of Northern Cyprus. 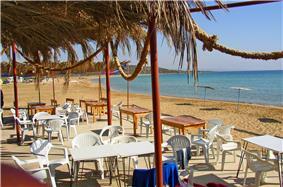 Sailing is especially found at Escape Beach Club, near Kyrenia. Turkish Cypriot cities and towns regularly organize festivals that include performances of local and international singers and bands. Some Turkish Cypriot singers, such as Ziynet Sali and Işın Karaca, have achieved fame in Turkey. The Turkish Cypriot band Sıla 4 produced music that is considered essential for the Turkish Cypriot identity, and also acquired fame in Turkey. Rock and pop music are popular with the public in Northern Cyprus, important singers and bands include SOS and Fikri Karayel. The majority of Turkish Cypriots (99%) are Sunni Muslims, whilst a small number are Ahmadiyya Muslims. Turkish Cypriots are highly secularized and many do not practice their religion. Alcohol is frequently consumed within the community and most Turkish Cypriot women do not cover their heads; however headscarves are still worn on occasion by public figures as a symbol of the inhabitants Turkish culture, or simply as a conservative form of dress. However, some religious traditions still play a role within the community. Turkish Cypriot males are generally circumcised in accordance with religious beliefs. There are 644 Greek Cypriots living in Rizokarpaso (Dipkarpaz) and 364 Maronites in Kormakitis. Between 180,000 to 200,000 Greek Cypriots were forcibly evicted from their homes in the North by the invading force of the Turkish army. Rizokarpaso is the home of the biggest Greek-speaking population in the north. The Greek-Cypriot inhabitants are still supplied by the UN, and Greek-Cypriot products are consequently available in some shops. Northern Cyprus's first official census was performed in 1996. The population recorded was 200,587. The second census, carried out in 2006, revealed the population of Northern Cyprus to be 265,100, of which majority is composed of indigenous Turkish Cypriots (including refugees from Southern Cyprus) and settlers from Turkey. Of the 178,000 Turkish Cypriot citizens, 82% are native Cypriots (145,000). 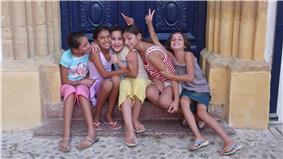 Of the 45,000 people born to non- Cypriot parentage, nearly 40% (17,000) were born in Cyprus. The figure for non-citizens, including students, guest workers and temporary residents stood at 78,000 people. With the lack of a railway system, the country's highways are used for transport between major cities. In the 21st century, these highways were upgraded into dual carriageways, with some roads in the Karpass area still being upgraded as of 2015. Northern Cyprus has around 7000 km of roads, with two thirds of these roads paved. Recent constructions included the construction of a Northern Coast Highway, which was hailed as a major incentive for economic development. In 2011, North Cyprus sold electricity to the Republic of Cyprus following an explosion in the southern part of the island which affected a large power station. The Northern Cyprus Water Supply Project, due to be completed in 2015, is aimed at delivering water for drinking and irrigation from southern Turkey via a pipeline under the Mediterranean Sea. Despite the constraints imposed by the lack of international recognition, the nominal GDP growth rates of the economy in 2001–2005 were 5.4%, 6.9%, 11.4%, 15.4% and 10.6%, respectively. The real GDP growth rate in 2007 was estimated at 2%. This growth has been buoyed by the relative stability of the Turkish Lira and a boom in the education and construction sectors. Between 2002 and 2007, Gross National Product per capita more than tripled, from US$4,409 in 2002 to US$16,158 (in current U.S. dollars). The growth continued through the 2010s, with real growth rates of 3.7%, 3.9%, 1.8% and 1.1% respectively in 2010-2013. The unemployment rate declined through the 2010s and was at 8.40% in 2013. In the national park in the Karpaz Peninsula around Cape Apostolos Andreas, there is a population of wild Cyprus donkeys around 1000. These donkeys, under the protection of the Turkish Cypriot government, are free to wander around an area of 300 square kilometers in herds. The donkeys have earned a strong image for the peninsula, which is also home to a rich fauna and relatively big forests. The beaches of Northern Cyprus also sites where hundreds of loggerhead turtles and green turtles lay eggs, which hatch at the end of the summer, followed by observers. Northern Cyprus is home to a large amount of ecological diversity and is a relatively unspoilt part of the Mediterranean Basin biodiversity hotspot, containing a variety of terrestrial habitats. Its flora contains around 1900 plant species, of which 19 are endemic to Northern Cyprus. Even in the urban areas, there is a lot of diversity: a study conducted on the banks of the Pedieos river around Nicosia found more than 750 different plant species. Among these species are 30 of the orchid species that are endemic to Cyprus. An endangered species that is the subject of folk tales and myths is the sea daffodil, found in the sandy beaches and endangered due to the disruption of their habitats. A 2011 article published in Defence and Peace Economics by Mete Feridun of the University of Greenwich and Bansi Sawhney of the University of Baltimore, military expenditure in North Cyprus has a statistically significant impact on economic growth. The presence of the mainland Turkish military in Cyprus is highly controversial, having been denounced as an occupation force by the Republic of Cyprus and the international community. Several United Nations Security Council resolutions have called on the Turkish forces to withdraw. In May 2015, the EU Infopoint office that aims to bring the Turkish Cypriots closer to the EU, has been inaugurated in North Nicosia. In October 2011, Libya signed cooperation treaties with TRNC government. On 18 February 2008, the Northern Cyprus government sent a message to the Republic of Kosovo congratulating it on its unilateral declaration of independence. A government spokesman clarified that this statement did not constitute, or signal an imminent move toward, formal diplomatic recognition of Kosovo. In contrast, the Republic of Cyprus has rejected Kosovo's declaration of independence and, given the ICJ ruling that Kosovo's declaration of independence was not illegal, stated that Kosovo and Northern Cyprus were not analogous situations. Some analysts have argued that the independence of Kosovo could provide support for the recognition of Northern Cyprus. Northern Cypriots have been applying for decades for passports issued by Cyprus. When the entry points with the Republic of Cyprus were closed, the applications were made either through middlemen or through consulates and embassies of Cyprus in other countries. A yearly increase in the number of applications for such passports of 10-15% was observed in years prior to 2001, when the rate greatly increased and 817 were issued in the first eight months of 2001 as compared to 448 for the whole of 2000. After the opening of the borders with the Republic of Cyprus, Turkish Cypriots started lineups applying for Cypriot passports by visiting the Republic of Cyprus and showing proof of their Cypriot ancestry.